The Mung (Moong) bean is small green bean commonly found in Indian and other Asian cuisines. It is one of the easiest beans to sprout- it takes about 3 days. Mung bean sprouts can be used in sandwiches, added to leafy green salads or stir fried with vegetables and meats. My favorite way of eating these sprouts is to use them in this salad recipe below. 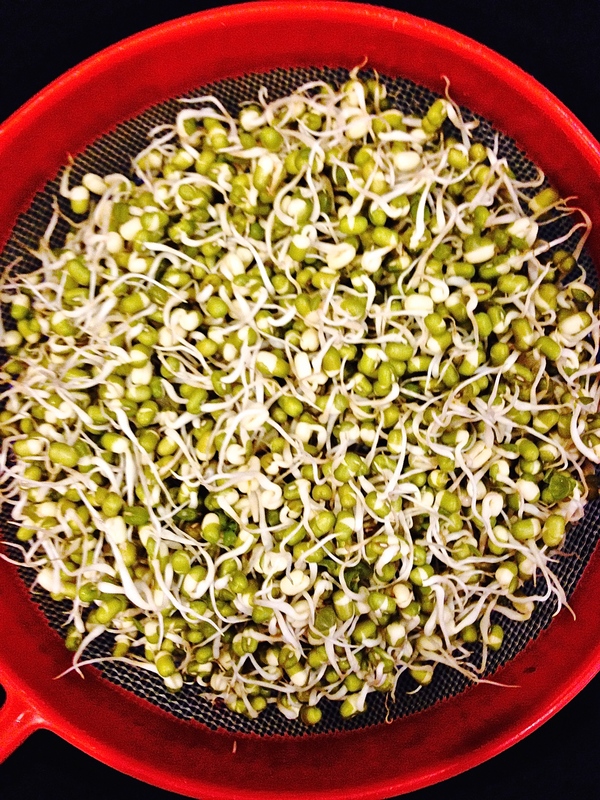 Mung bean sprouts are easy to digest and and high in protein, Vitamin B and fiber. Soak the mung beans overnight. The next morning, drain and rinse the beans, place in a sieve or strainer, cover with a lid or foil and place in a dark place such as inside a kitchen cabinet. In the evening, rinse the beans and put them back in the cabinet. You will see sprouts appear in a day or so – repeat this every morning until the sprouts are about 1/2″ long or more as desired. Refrigerate in an airtight box if not using it at once. Add the sprouts to a large bowl. Mix in the remaining salad ingredients, cover and refrigerate until ready to use. NOTE: Some people prefer sprouts to have a softer texture. If so, add the sprouts to a large bowl, pour boiling water to cover the sprouts. After about 5 minutes, drain and cool the sprouts before adding the other ingredients.